Create intricate base masks for hard selections within seconds with just a few mouse clicks. Refine your base masks fast, easy and non-destructively using the buttons under Quick Refine Mask. This replaces the traditional, labor-intensive, workflow of manually refining your mask using a brush or pen and tablet and zooming in a few hundred percents. To bring out the most delicate parts of your image, like fences, cables, antennas or even hair, use Advanced Refine Mask. Every selection tool is based on detecting contrasts or differences in luminance values. Quick Mask Pro can create selections based on luminance levels of just 1 luminance value difference. The secret of this tool is in the automatic creation of base masks based on the histogram, and the tools to refine the base masks using smart fill presets, globally or within a designated area of the image, very accurately. Anyone with basic PS knowledge can use this panel since you don’t need any specific selection/masking technical knowledge. Make sure that your computer can run the latest Photoshop version. See also Adobe’s website for specifics. 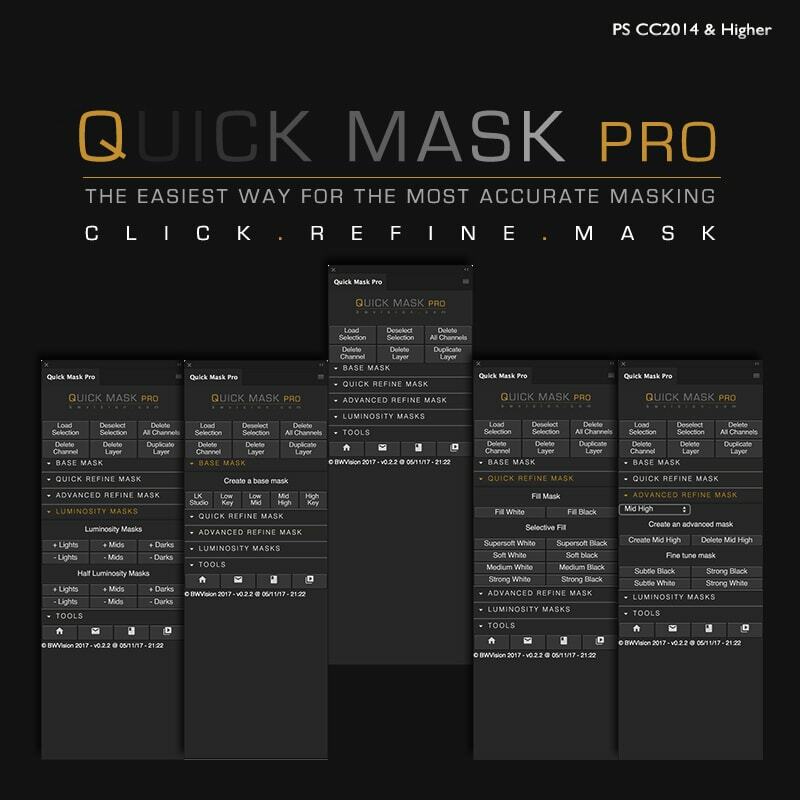 The Quick Mask Pro Panel. Installation instructions manual and video. An accompanying video tutorial of 25 minutes, exclusively made for this panel, with very advanced tips and tricks that will enhance your PS general knowledge.